By 2018, it is anticipated that we will see a network traffic increase of 473%, according to a Business Insider Intelligence report. We will jump from approximately 1.9 billion connected devices in use today to more than 9 billion over the next four years. Future networks will need to accommodate the significant increase of smartphones, smart TVs, tablets, wearable computers, and PCs in use. Fortunately, the collaborative innovators of the Berk-Tek Leviton Technologies alliance have developed an unprecedented solution for meeting future network demands, today. 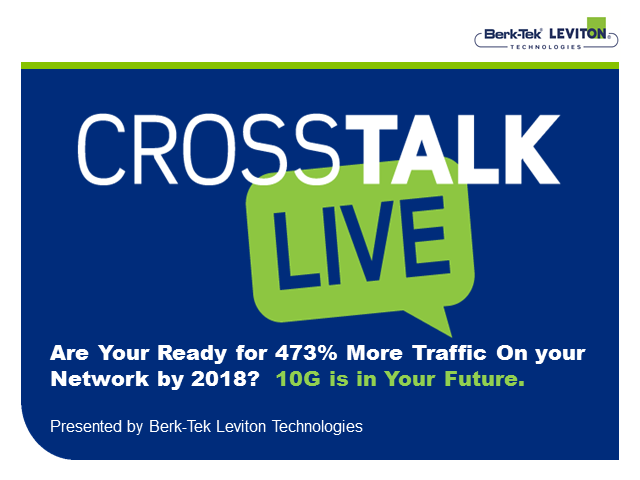 This session of CrossTalk Live will provide solutions to ensure your network is ready for the massive wave of network traffic growth by 2018. Brought to you by Berk-Tek Leviton Technologies. The Intact™ Intelligent Port Management System makes it easy to monitor port status and manage network changes. Combining intelligent patch cords and panels, the Intact system sends alerts and real-time information back to IT managers, where they can diagnose problems and handle changes faster using the Intact software. The latest innovations lower network cost and are accelerating end-user migration towards 10GBase-T. Keith Kosanovich, Senior Product Manager at Leviton Network Solutions will share the state of the industry today. Learn CAT 6A adoption in the industry and how it in emerging as the dominant copper platform for Data Center, enterprise and big data applications. The e2XHD Patching System provides a high-density solution for enterprise and data center applications, where fast deployment and simple maintenance are priorities. e2XHD fiber and copper cassettes quickly snap in and pull out of the high-density 1RU and 4RU panels, making installation, moves, adds, and changes easier than ever. Leviton’s Overhead Infrastructure Platform provides a fully independent network pathway support for network lighting, power, cabling, and other infrastructure. Platforms can carry the load of cables and ladder trays while FREEING UP RACK SPACE by adding patching above cabinets or racks. Since cabinets and racks are not attached to the overhead infrastructure, power and cabling can be quickly disconnected without removing hardware. Join Leviton expert Gary Bernstein, RCDD, CDCD, for a presentation on emerging switch architectures and the impact on 40/100 GbE data center migration. Get a detailed overview on new active equipment architectures from leading manufacturers, developing TIA cabling requirements, and their impact on cabling designs.